Ananka's Diary: This Is the First and the Last Time I Will Say This: OMG! This Is the First and the Last Time I Will Say This: OMG! There are SHRIMP in New York City's drinking water! 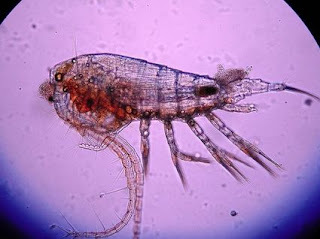 Tiny, microscopic crustaceans! The clear-thinking folks at National Geographic have tried their best to assure the water-drinking public that the wee beasties aren't dangerous (and they ARE kosher). But OMG! There are SHRIMP in New York City's drinking water. I LOVE shrimp! Wow, there's nothing for me to say except, well, OMG!!! That's AWESOME!!!! ummmmm...............if i lived in new york, i wouldnt drink that. shrimp freak me out. Ahaha only you would be happy!! Remind me not to tell my grandmother then she won't even drink water and note to self don't drink the water either. Shrimp are yum! I would drink it...but only if it was cooked. oh gosh ...those poor shrimp D: and what about the vegetarians of the city?! they'll have to stop drinking the tap water. REALLY???!! how big? I will be buying bottled water for THE REST OF MY LIFE! You all know NYC water comes from where I live and the Catskills right? So its bot really clean water unless pipes get contaminated. Good catfish fishing too. My uncle says they're huge. But the DEC get pissed if u do. Ah well. So mr bugs bunny, tell me about the beginning. Thunder! Lightning! Two tiny amoebas! what do you think would happen to the little buggers if you boiled the water? what about freezing the water? do you think theyd die or live? I'm sorry, but I hate shrimp. Actually, I hate all seafood except for calamari. The tentacle parts freak me out though, just the ring kind for me. Please don't go drinking only tap water. Please don't drink it 24/7. I'm sorry, I just don't think I could handle the trauma of the world's best author dying. You said "OMG" twice, Ananka. Although I don't blame you because that is awesome. I really need to move. @Kitty: Shrimp (and other crustaceans) and insects are both arthropods. EEEEWWWWWWWWWWWWWWW!!!!!!! thank goodness I don't have to deal with shrimpy water! "mm, flavored tap water! what flavor is this?" *gagging noises* "oh no, i was poisoned!! actually, it tastes like seafood. i LIKE seafood..."
"um. ok then. uh. why dont you clean up all the water you coughed on the floor so no one slips on it. and you probably dont want to drink any more of it." thats just a random little scene i imagined when i read that post. Please, can I come live with you so I can have shrimp for the price of water? Well that's bad new for us vegetarians...and we thought water was the only 100% safe thing..